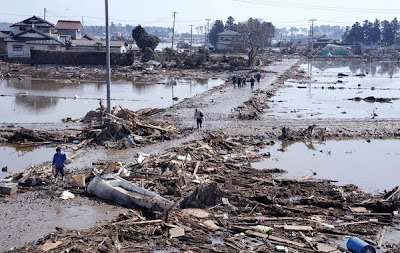 March 11, 2012 marks one year since a massive 9.0-magnitude earthquake struck off the coast of Japan, triggering a devastating tsunami that slammed into the island nation, killing thousands of people. More than 300,000 people are still homeless and around 3,300 others are unaccounted for. The tsunami also sparked a nuclear reactor meltdown at the Fukushima Dai-ichi plant, resulting in the worst nuclear accident since Chernobyl. One year on, the streets have been cleared and the wreckage removed from town centers. 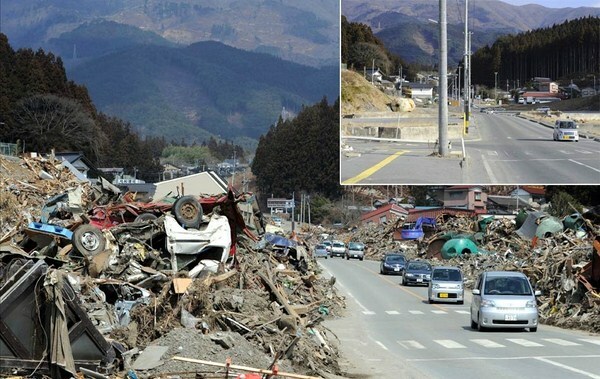 Here’s a look at how much has changed in 12 months since the massive earthquake struck Japan. This combo photos below shows an image (top) taken by a Miyako City official on March 11, 2011 of the tsunami breeching an embankment and flowing into the city of Miyako in Iwate prefecture and the same area (bottom image) on January 16, 2012 nearly one year after the March 11 tsunami devastated the area. 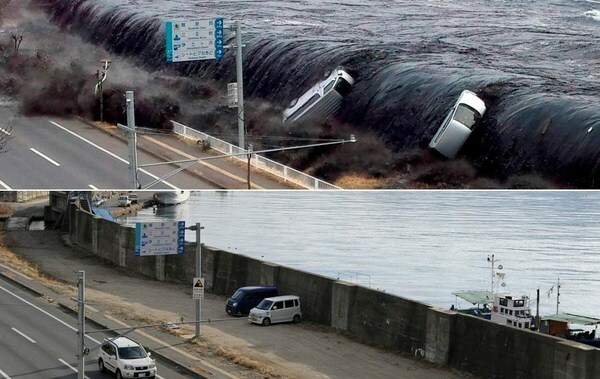 March 11, 2012 will mark the first anniversary of the massive tsunami that pummelled Japan, claiming more than 19,000 lives. This combo shows a photo of Yuko Sugimoto wrapped with a blanket standing in front of debris looking for her son in the tsunami-hit town of Ishinomaki in Miyagi Prefecture on March 13, 2011 (L) and the same housewife standing with her five-year-old son Raito at the same place on January 27, 2012 (R). 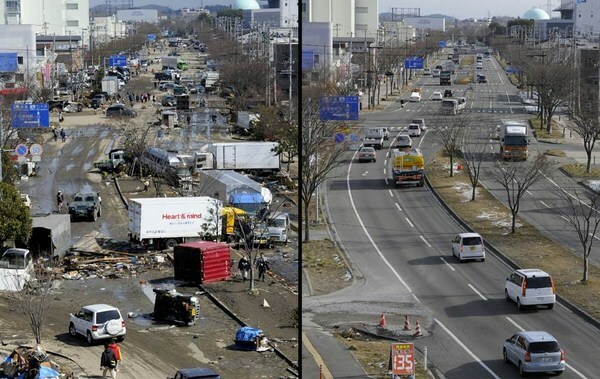 March 11, 2012 will mark the first anniversary of the massive tsunami that pummelled Japan, claiming more than 19,000 lives. 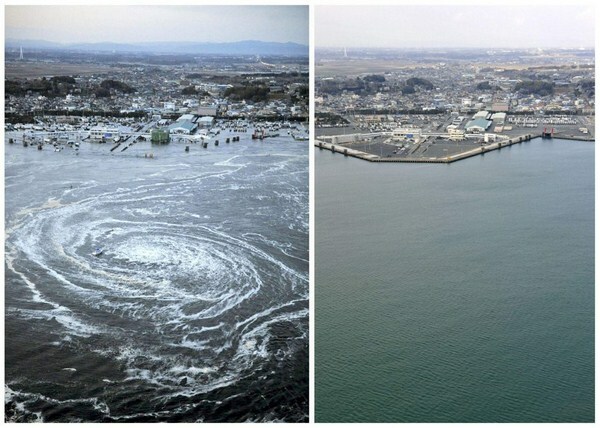 A combination photograph shows the same location in a fishing port in Miyako, Iwate Prefecture, northeastern Japan on two different dates, March 11, 2011 (top) and February 16, 2012 (bottom). 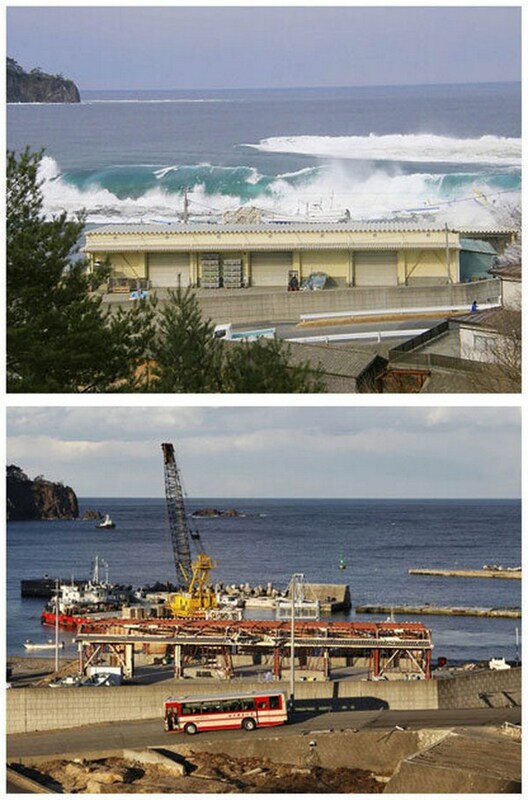 The top photograph shows a wave crashing into the port after the magnitude 9.0 earthquake and tsunami, the bottom photograph shows the same location almost a year later. 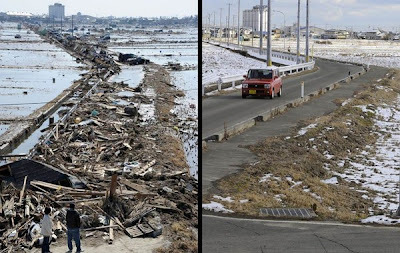 This combination of pictures shows the view of a tsunami hit area of Ofunato, Iwate prefecture on March 14, 2011 (L) and on January 15, 2012 (R). 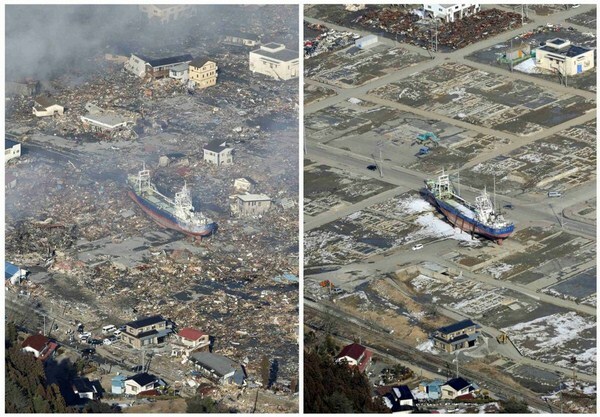 March 11, 2012 will mark the first anniversary of the massive tsunami that pummelled Japan, claiming more than 19,000 lives. This combination of pictures shows a tsunami hit area of Rikuzentakata, Iwate prefecture on March 22, 2011 (top) and the same area on January 15, 2012 (bottom). March 11, 2012 will mark the first anniversary of the massive tsunami that pummelled Japan, claiming more than 19,000 lives. 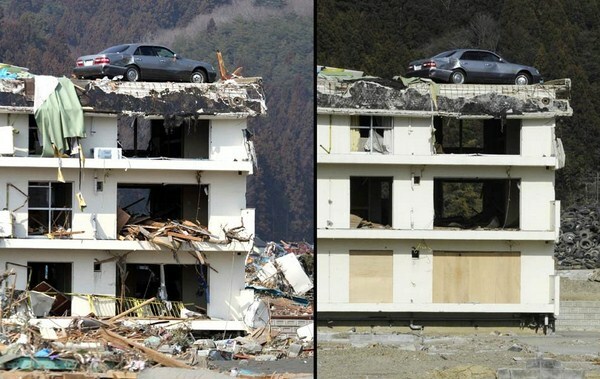 This combination of pictures shows a vehicle sitting on a three-story building in a tsunami hit area of the town of Minamisanriku in Miyagi prefecture on March 13, 2011 (L) and the same area on January 14, 2012 (R). March 11, 2012 will mark the first anniversary of the massive tsunami that pummelled Japan, claiming more than 19,000 lives. 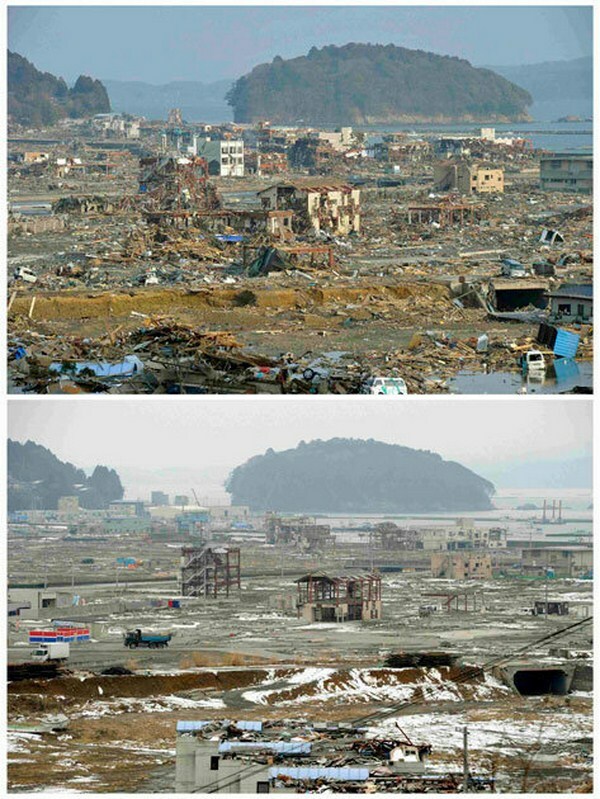 A tsunami-devastated area in Kesennuma, Miyagi prefecture, is seen in these aerial view images taken March 12, 2011 (L) and March 3, 2012, in this combination photo released by Kyodo on March 7, 2012, ahead of the one-year anniversary of the March 11 earthquake and tsunami. A whirlpool caused by the March 11, 2011 tsunami is seen near Oarai City, Ibaraki prefecture, in this image taken March 11, 2011 (L), with the same area being shown on March 3, 2012, in this combination photo released by Kyodo on March 7, 2012, ahead of the one-year anniversary of the March 11 earthquake and tsunami. ( Top ) Residents walking on roads covered with mud and debris in a tsunami hit area of Sendai, Miyagi Prefecture, on March 14, 2011. ( Bottom ) The same road which has been modified after the massive earthquake. 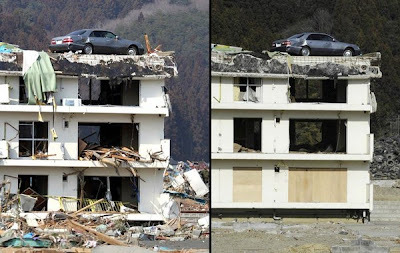 This combination of pictures shows local residents looking at a tsumami hit area of Sendai, Miyagi Prefecture, on March 14, 2011 (L) and the same area on January 12, 2012 (R). 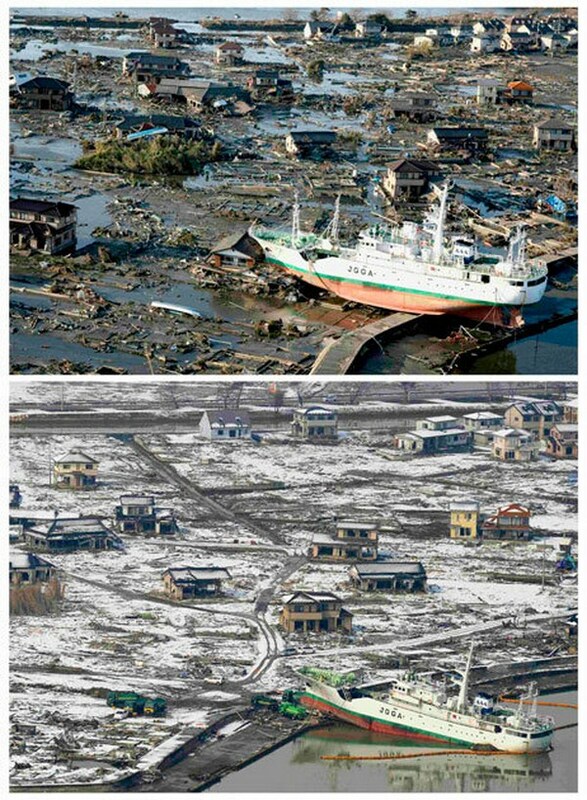 March 11, 2012 will mark the first anniversary of the massive tsunami that pummelled Japan, claiming more than 19,000 lives. 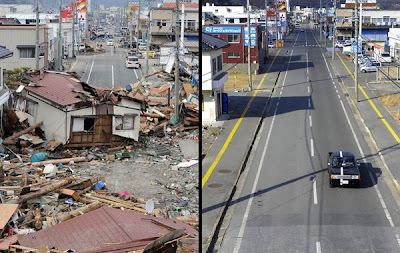 The tsunami-devastated Minamisanriku town in Miyagi prefecture is seen in these images taken March 13, 2011 (top) and March 3, 2012, in this combination photo released by Kyodo on March 7, 2012, ahead of one-year anniversary of last March 11 earthquake and tsunami. A tsunami-devastated area is seen in Kesennuma, Miyagi prefecture, in this aerial views taken March 12, 2011 (top) and March 3, 2012, in this combination photo released by Kyodo on March 7, 2012, ahead of the one-year anniversary of the March 11 earthquake and tsunami. 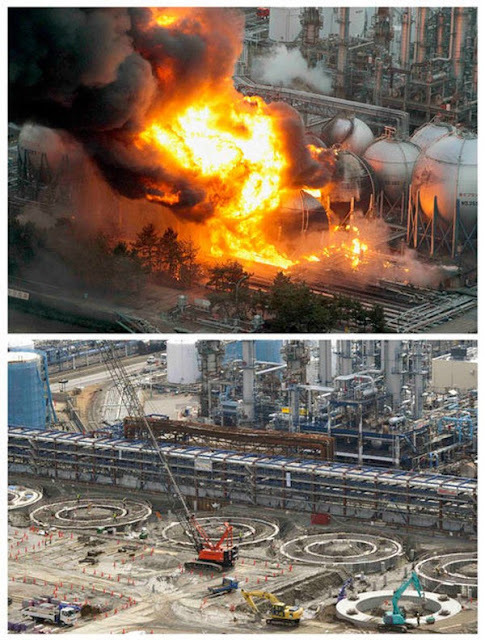 A combination photograph shows nuclear reactor meltdown at the Fukushima Dai-ichi plant, resulting in the worst nuclear accident after the tsunami hit the region on March 11, 2011 (top). The nuclear reactor which is been removed and cleaned after one year since the massive earthquake (bottom). A combination photograph shows the same location in Otsuchi, Iwate Prefecture, northeastern Japan on three different dates, March 15, 2011 (top), August 13, 2011 (centre) and February 18, 2012 (bottom). 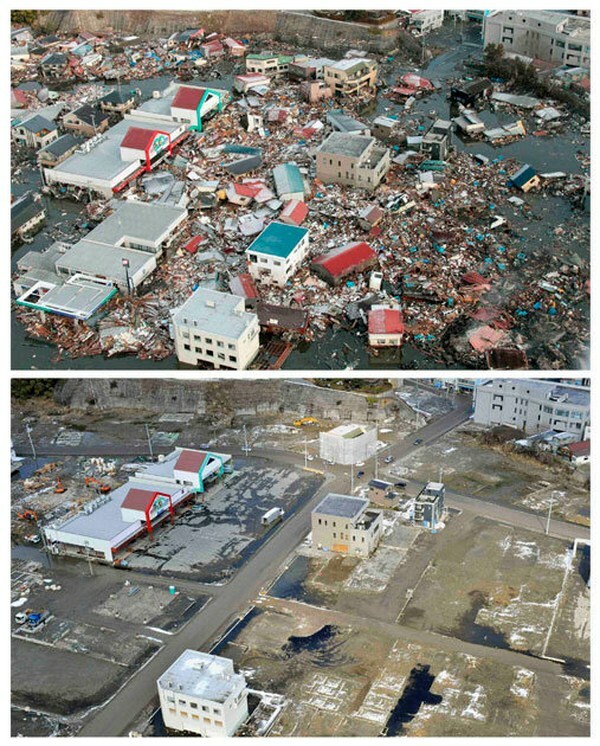 The top photograph shows a shop destroyed by the magnitude 9.0 earthquake and tsunami, the middle photograph shows the area around the shop after it was cleared of debris, and the bottom photograph shows the shop trading again in the same location almost a year later. The shop had reopened December 22, 2011. This picture (L) shows a roadway where the cars piled up and damaged after the tsunami hit the region on March 11, 2011. 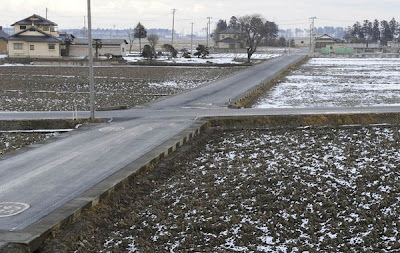 The same roadway which has been cleaned and used for transportation once again (R). 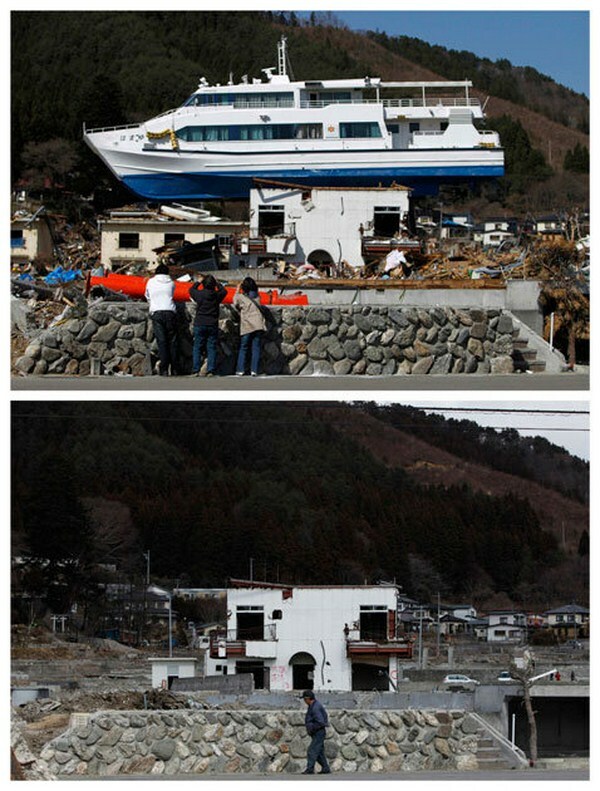 This picture (L) shows people taking photos of a wrecked ship on the top of a damaged building after the tsunami hit the region on March 11, 2011. The same building where the wrecked ship has been removed (R). 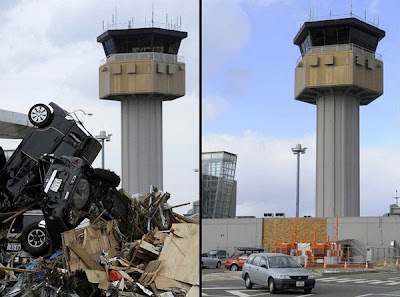 This combination of pictures shows cars piled up in front of the airport control tower in Sendai on March 14, 2011 (L) after a tsunami hit the region on March 11, 2011. The same control tower which has been cleaned after the massive earthquake (R).